It’s cold outside. Steep a cup of tea and put in a teaspoon of pure, local, raw honey. Then take a sip, close your eyes, and feel that warm golden glow. Give thanks for the angels of agriculture: bees. Homegrown Honey Bees: Beekeeping Your First Year, from Hiving to Honey Harvest, by Alethea Morrison is an introduction to beekeeping and a recruitment tool for a grass roots environmental movement to protect the pollinators and savor their sweet honey. There is a resurgence of interest in the traditions of beekeeping and an urgent need to prevent the extinction of Apis mellifera. Colony collapse disorder, the drastic disappearance of honey bee colonies in North America which began in late 2006, is something about which most farmers care because many agricultural crops are pollinated by bees. Apples, berries, peaches, pears, cantaloupes, cherries, cranberries, watermelons, cucumbers and soybeans are just some of the crops that honey bees pollinate. While some attribute the problem of colony collapse disorder to mites or insect diseases, others attribute the loss of bees to pesticides, malnutrition, cell phone radiation, genetically modified crops, or environmental change-related stresses. The USDA reported in 2010 a combination of factors rather than a single cause, but to date has not developed an effective policy. The good news is that colony collapse disorder is less common in small-scale beeyards than it is in large-scale commercial operations. If you are a small scale farmer, now is a great time to take up beekeepng and help protect our future as farmers. I’ve always been a bit nervous about the whole idea of keeping bees. I’ve spent half a century avoiding getting stung. But who doesn’t like honey? Bees aren’t naturally inclined to sting like yellow jackets; which are actually in the wasp family and not bees at all. I started to relax when I learned African Honeybees aren’t even honey bees but undomesticated swarms. They’re the wild pigs who give pork the slur of swine in the insect world. Just like certain meat animals, bees are bred for their tendency to be less defensive and less likely to sting. This genetic trait in bees is known as gentleness. Like rounding up cows to head to the milk house, beekeepers use a smoker to corral the insects. Scientists think smoke may mask many of the pheromones that signal danger and diminishes their natural threat alert. 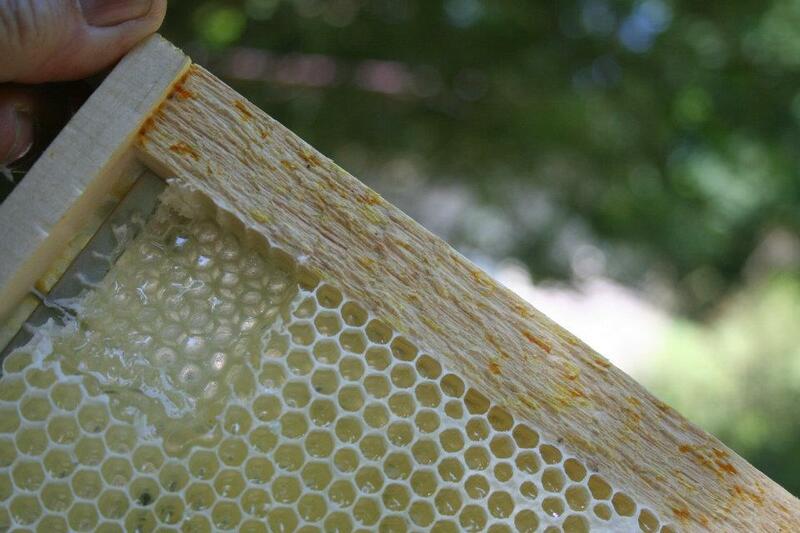 Many of the practices of beekeeping are more steeped in historical tradition than scientific explanations. “Aristotle surmised that bees collected honey from rainbows. He may not have gotten the science right, but he was spot on with the poetry of its flavor,” writes Alethea Morrison in the opening chapter. Apis mellifera, commonly known as the honey bee, is one of about 20,000 different species of bees. European settlers brought the bee with them in the early 1600s and the environment suited the species as it spread widely across the United States. 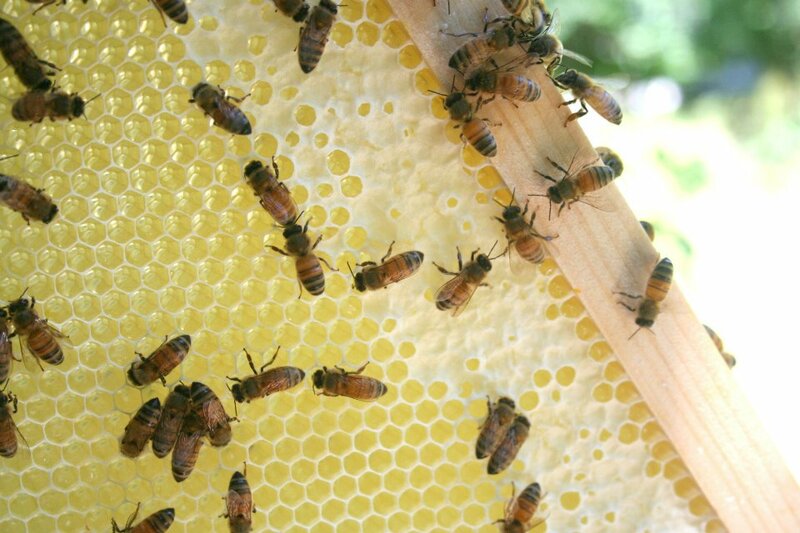 Beekeeping and farming came of age hand in hand in the northeastern United States. One of the most successful and prolific beekeepers in the world during the 19th century was W.L. “Lamar” Coggshall of Groton, New York. His great grandfather, John Coggshall arrived in the early 1600s from England and the family farmed in Rhode Island, Connecticut and moved to richer soils in upstate New York in 1820. Lamar Coggshall (b. 1852) was a farmer who expanded his bee colonies and the first in New York to create out-yards. He expanded the bee business west to Arizona, Colorado, and to the south as far as Cuba. Apis mellifera is the only species of honey bees cultivated for pollination and honey production. Scientists categorize bees by race and in North America there are Italians, Russians, and Carniolans. This colorful book is a wonderful introduction to apiaries and chock full of facts and photos. It provides the answers to why you might keep bees, but also shows you up close how to do so in sync with the seasons of the calendar. Winter is the perfect time to start reading about bees and now is the time to begin preparations. The hum of ten thousand bees comes from rapid beating of wings. Bees have no voice. Morrison translates their behavior to address the question: What am I getting into? From the first month, the first season through the first harvest, these step by step instructions walk the novice through the annual cycle. Homegrown Honey Bees includes contemporary stories of beekeepers in big cities, small towns, and on small farms. Matt and Jill Reed starting keeping bees in Portland, Oregon just a couple years ago and now manage 25 colonies in the metropolitan area. In Austin, TX, Karl Arcuri describes his single hive and introduces his four queen bees by name, including one known as ‘Large Marge’ from ‘Pee Wee Herman’s Big Adventure’. Drew and Ali Johnson’s quarter acre homestead in Kalamazoo, Michigan is an extension of their backyard farming. And Bobbi and Greg Marstellar in Chicago who lost their rooftop hive over a harsh winter share their stories, too. 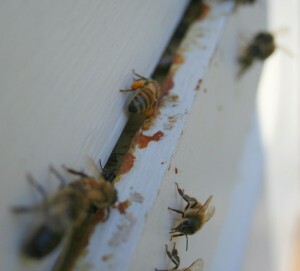 : Bees carrying pollen back to the hive. Beekeepers Alethea Morrison and Mars Vilaubi document their own beginnings with their first hive. They share their challenges of replacing a failing queen bee to sustaining a colony over an extremely cold winter, and the joys of tasting their own raw honey harvest and being part of the solution to the problem of colony collapse disorder. Bees don’t hibernate during winter. Bees huddle close together in their hive to generate heat and live off their stockpile of honey. By vibrating their wing muscles, which looks a little like shivering, the bees increase their body heat. They form a winter cluster, snuggling and wiggling toward the center. Bees rotate positions so none of them freeze. Whether you start a hive this year or not, whether you dream of becoming the next bee whisperer, this is a warm read that glows with honey. If you have a family, or are a teacher, you will find this highly visual reference an introduction to becoming a happy, confident, and successful beekeeper. Homegrown Honey Bees, published by Storey in January 2013, gives good buzz to bees. Jill Swenson is a former farmer and the president of Swenson Book Development, LLC, based in Brooktondale, NY. She may be reached at jill@swenbooks.com or 607-539-3278.
does cornell still have a bee yard and anyone in the area raise bees? Hi Stephanie! I would suggest checking out the beekeeping resources under our production page. There you will find the contact information for many local beekeeping clubs that may be able to connect you to specific people in your area that raise bees. I believe the Cornell Bee Club raises bees at Dilmun Hill Student Farm, but you may want to contact them or visit their Facebook page to be sure.